I dressed in casual basics for the weekend. 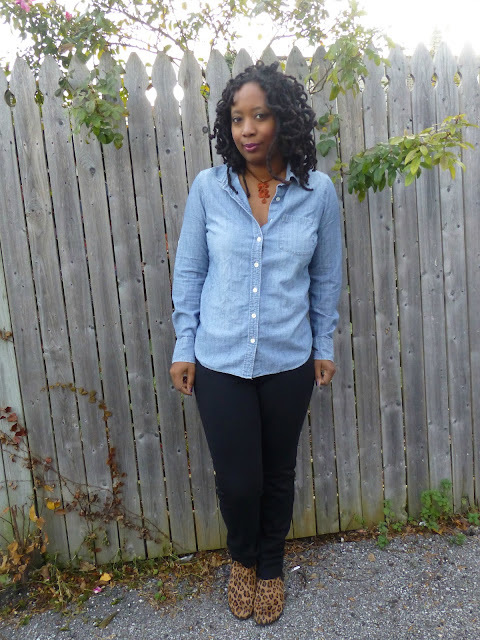 Chambray shirt. Check. Knit pants. Check. Cargo pants. Check. Also in normal fashion, I added my own little burst of pow as a "defrumper". On Saturday, I attended the Chicago Toy and Game fair and I knew I would be doing lots of walking and carrying bags and pushing V in the stroller. I also had to be out the door at 7:30 am in order to make it to the blogger breakfast. I pulled this simple ensemble together in minutes and was out the door with V (of course, taking a few minutes to snap pics) in under an hour. Sunday, I went to an SEO training (btw, it was amazing!). Since I was baby free and would be sitting, I finally had a chance to wear the pointy toe DvF booties. They are not for a casual stroll. Left baby toe was crying for a seat in the 5 minute walk from car to class. 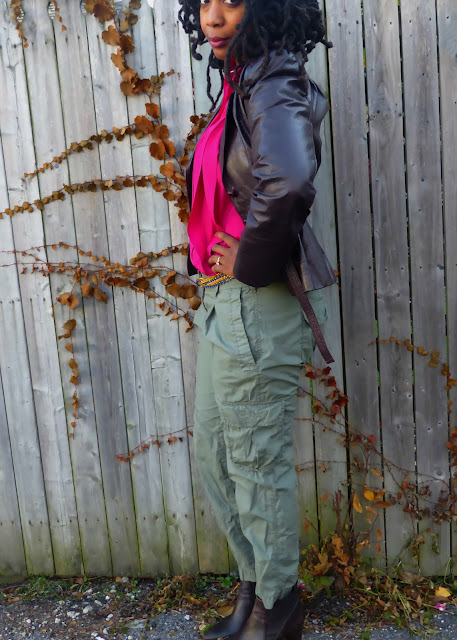 I'm still experimenting with cargo pants. I bought these army green pants these for the tapered ankle length but the pleats on the front just aren't very flattering for my shape. I probably should have just untucked my blouse. Oh wells. Next time. Now the blouse. I love this color! I wish I had more of it in my closet. It's amazing.The pleated front is great too. They hide the squish. I may have to wash and wear it on Thanksgiving. It will go well with the obligatory stretchy pants. I have such a love hate relationship with sparkly nail polish. Love to sparkle. Hate the chore of removing it. Argh. I used Essie Recessionista with Stroke of Brilliance on top. Recessionista is a plum color and Stroke of Brilliance has large blue glitter specks which probably explains the navy-ish color in the picture. It's more of a burgundy color in real life. In unrelated news: My blogiversary was this weekend. Thriftanista in the City is 2 years old! 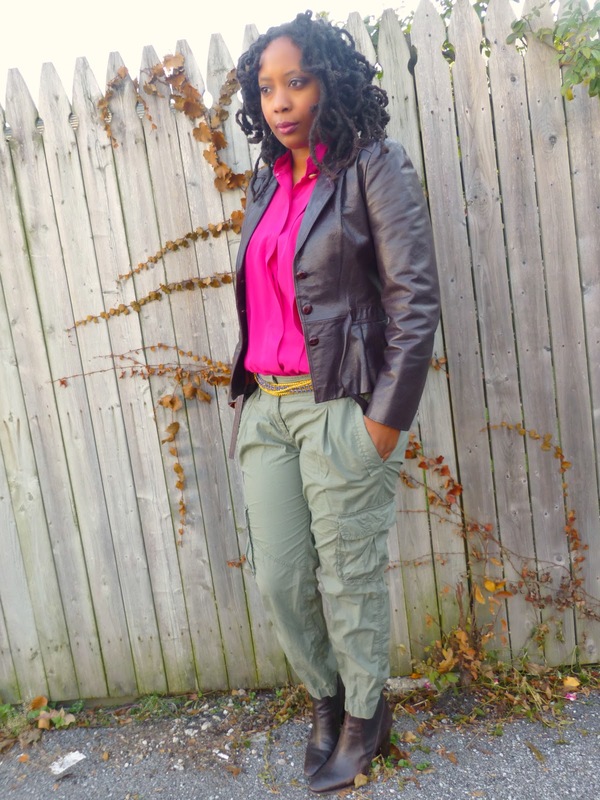 Love those cargo pants! And I need a chambray shirt. oh yes yes yes. you must add the "defrumper". I love that word. Leopard is always the best for that. Your hair is OUTSTANDING, i love it. Love leopard shoes and you can never go wrong with a denim shirt. I love the hot pink and army green together! And those beautiful leopard booties! Cute looks! That jacket is HOT! Let me know when you are over it. Love the pink blouse!! Beautiful shade of pink. I defrumped today by putting on an ImPress Press-On Manicure that I got in my VoxBox. I have to say that I have a little pep in my step. I feel extra cute right now!